This is a twist on the classic 1460. The smooth leather from the original Dr. Martens men’s boot has been swapped for a utilitarian waxed canvas, taking a inspiration from army kit bags. But style is as far as the military influence goes; this durable boot from the Core collection isn’t for following leaders or falling in line. This boot is working class-for riffs, and rebellious free thinkers. It’s all waxy canvas, except for the top binding and the heel strap-that’s in new Laredo leather for contrast. There’s silver antique eyelets, tonal stitch on the welt, and scripted heel loops add some refinement. It has the iconic air-cushioned sole, that’s oil-and-fat resistant with good abrasion and slip resistance. 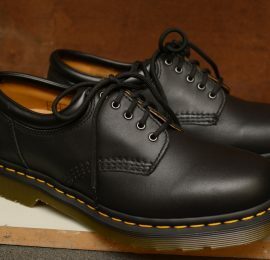 Finally, this shoe is Goodyear-welted, meaning the upper and sole are sewn together in our heat-sealed z-welt stitch.